The Data Slicer only looks for students—those who have some sort of academic record or even just the Student role. The Filter lets you select the conditions you'll use to find the students you wish to report on. Read about the different terms and operators you'll encounter in the filter. People: Information found on the Profile > Info view (contact info, maiden name, etc.). Academic: Anything that figures into the information you can find on the Profile > Student view—transcript items, degrees, programs, etc. It will not retrieve course-specific items like individual assignment grades. Financial: Basic student billing-related items like current balance, expected financial aid, pending charges, etc. Custom: Information contained in any custom person, admissions, or student field. Click the drop-down menu and scroll to find the data field you're after. Most selections will bring up additional selections and inputs so you can clarify the exact information you're after. adds the condition you've just set up and opens up another one. Click Update to refresh the report and show who fits your conditions. The Columns tool lets you add (or subtract) information about the students you discovered in the Filter tool. Click to add a new drop-down from which you may select an additional data column. Add as few or as many columns as you wish. Click to remove a column. Click Update to refresh the table and show all the data you're looking for. The Aggregate tool creates graphs and tables of the data associated with the students you have grouped together in the filter. To use the tool, select a data category from the drop-down and fill in any additional selections and inputs. When you're ready, click Update to display your data. The Reports screen lists all saved reports (see Actions, below). Click to load the report; this loads the relevant info in all three Data Slicer tools. Click to delete the report. Export PDF: (Aggregate only) Create a PDF of the aggregate graph and report. Apply Tuition Schedule: Lets you add, remove, or replace tuition schedules for the students in the report. Apply Charge/Credit: Read about adding charges here. Apply Payment Plan: Read about applying payment plans. Generate enrollment agreements: This article describes how to create enrollment agreements for the appropriate students in your report. Apply Communication Plan: Put all of the students in your report on the same Communication Plan; just select a Plan from the drop-down and Save. Enroll Students: Read about enrolling students here. Export Transcripts: Produce transcripts for all of the students in your report. Choose between Official and Unofficial, select a program, and finally whether to include course descriptions. Export ID Cards: This lets you export school ID cards for everyone shown on the report. Choose a template and click Print. This creates a PDF that you can then send to your ID card printer (or other printer). Print Address Labels: Creates a printable document (PDF or ODT) of the primary addresses for the students in your report. Choose a type, layout, and format and click Print. Tag Results or Untag Results: Create and add a new tag to all the students returned by your filter conditions, or search existing tags and remove them from anyone in your filtered group with that tag. 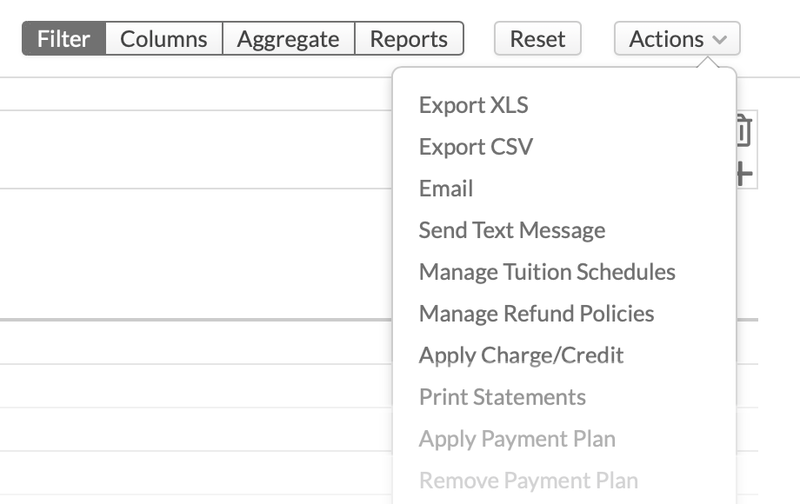 Set Custom Field: Add the same custom information field for all of the students in your report. Edit Honors: Apply the same Honors to all of the students in your report. Lock/Unlock Results: Add/remove a Registration, Grade/Transcript, or Financial Lock to all the students in the report. Save Report: Saves the conditions, columns, and aggregations you have selected as a report. If you've loaded an existing report, this action saves any modifications you've made. Manage Advisors: Lets you add and remove Advisors from the students in your report. Read more about this feature. Create Users: Populi Account Administrators can create user accounts for all of the non-users in the report. This article describes how. Save As New Report: If you've loaded an existing report and have modified it, this simply creates a new report without affecting the existing one. And retrieves students who fit both conditions. Or returns students who fit either one or any other condition (depending on how many you've entered). And is more restrictive; Or is more inclusive. Term GPA is greater than or equal to 2.5 AND Cumulative Credits is greater than or equal to 48: this will only find students with both that many credits and a GPA higher than 2.5. Term GPA is greater than or equal to 2.5 OR Cumulative Credits is greater than or equal to 48: this will find students who have either that many credits or a GPA higher than 2.5. Selecting IS to include only the following condition. Select IS NOT to exclude the following condition.Is retrieves more specific results; is not includes a wider range of results. Entrance Term IS Autumn Term 2008-2009: this retrieves only those students who entered the college in that academic term (regardless of standing). Entrance Term IS NOT Autumn Term 2008-2009: this retrieves all students who entered your school, except those who came aboard in Autumn Term 2008-2009. These operators work on fields with a numerical value, such as test scores or birthdates. Greater than… or Less than… should be self-explanatory. When dealing with dates, Greater retrieves dates that come after your selection, and Less retrieves dates from before. From opens fields that let you select a range of values. High School Grad Date is Greater than or equal to May 10, 2010: This finds students who graduated on or after May 10, 2010. ACT is From 25 to 30: this retrieves only those students who took the ACT and have scores from 25 to 30. These operators help define text search fields, such as names or addresses. Contains treats your entry as a string and retrieves all the text containing that string; it is the most inclusive of these operators. Starts/Ends with are more limited operators, which retrieve text that begins or ends with your entry string. Equals retrieves only that text that exactly matches your entry; it is the most restrictive of these operators. Address is Home, Street contains 42 Main finds students whose addresses are everything from 42 Main Street to 18842 Mainline Boulevard, Apt. 245. However, it will not retrieve 42 North Main Street because it searches for the 42 Main text string. Address is home, Street equals 42 Main Street finds students whose address is 42 Main Street—and not, say, 421 Main Street. Equals searches may require some trial-and-error to get results. Address is home, Street starts/ends with Main will most likely find no one (unless Main is all that is entered for someone's address). A search for ends with Avenue might be more fruitful, since the text string Avenue appears at the end of many street addresses. Are functions under Actions based on user roles? i want to tag but i don't see it under actions.